Fundraising is vital to the Playgroup, without it we could not continue. 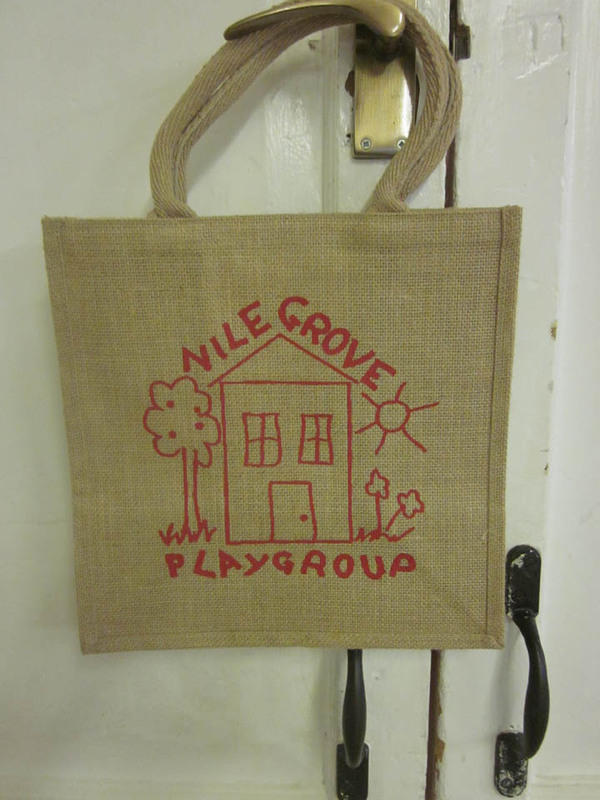 Nile Grove Playgroup are selling these eco-friendly jute bags as a natural alternative to plastic bags and also to help raise funds and awareness of our playgroup. Use them to carry your children’s artwork home or for essential shopping. A perfect way to avoid the 5p levy charge on plastic bags! These can be purchased from the staff at playgroup or order below. Cost: £4 for one or £7 for two. Nile Grove Playgroup hosts two main fundraising events annually with great success. The fundraising convenors on the committee work very hard to make these events run smoothly and they are thoroughly enjoyed by children and staff. We thank you for your continued assistance in raising funds and donations. Each year we create various beautiful luxury hampers for our raffle. We ask parents to donate goods and sell raffle tickets. Our committee ask local businesses for prizes too and in the past this has been very successful. We draw the raffle at the end of the Children’s Christmas party, which parents are invited to watch. In December 2015 we raised £653.00 – a fantastic amount. Annually we create and run a sponsored obstacle course for the children. Each child is given a sponsorship sheet and we ask parents to complete this. The children love taking part and the event is run over 3 mornings to allow most children to complete it on at least one day. Parents are invited to come and cheer their children on. The time this event is scheduled changes annually and last year it was held in the summer term. Children receive a certificate on completion of the course to show all their sponsors. In February 2016 we raised £1019.20 – well done everyone. Every couple of years we try to host a fundraising event in the summer term to boost our fundraising efforts. This year we had a fantastic fundraising committee who organised a brilliant evening full of fun and it was a huge success. Many local businesses donated prizes as well as donations from parents. Thank you to everyone who supported the event. In May 2016 we raised £6826.70 – well done everyone.